I just finished reading an excellent Wikipedia article about point of view. Asides from adding another 50 books to my ever growing wishlist, it made me think about Alligator and the other books I've read recently. Most have definitely been written in the third person. Over the past year, the only exceptions I can think of have been Joseph Boyden's Three Day Road and William Faulkner's As I Lay Dying. 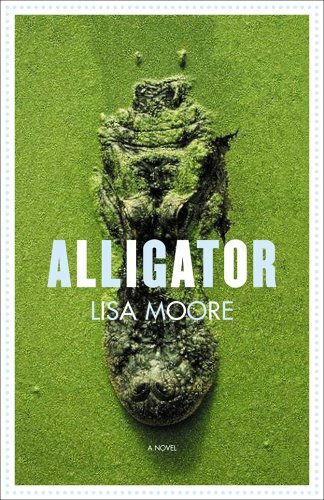 Lisa Moore's Alligator, from what I understand, is written in the third person omniscient. Again, this seems to be a very popular choice amongst authors. But lack of originality aside, Moore does it well. I especially like how she handles symbolism. She seems to leave it up to the characters to decide what provides meaning to them. Frank for instance, seems to be focused on spanworms as omens. Sometimes I find authors make symbols out of something that in all honesty would be foreign or at the very least ignored by their characters. Moore seems to avoid such pitfalls. I personally don't have a preference as to what point of view a story is told in. However, I am looking forward to reading another not in the third person- just to mix things up slightly. What about you- any preference? Any memorable books that aren't third person? Ian (M.) Banks (sometimes he uses the M., sometimes he doesn't) wrote an interesting book (A Song of Stone)which used first person narration, but the whole thing was in the present tense. It was interesting and challenging to read. The other book I've read with an interesting narration technique is Jeffery Eugenedies' The Virgin Suicides. There's not a single narrator, but rather a group which speaks with one voice, much like a Greek chorus. I can't believe I missed something so obvious. This morning I was trying to think of very memorable first person books, and both J.D. Salinger's Catcher In The Rye and Mirian Toews' A Complicated Kindness came to mind. I thought it interesting that both were written as if from a teenager's perspective. That of course made me think of Alligator's Colleen. So I checked back, and Moore DOES use first person for her, and her only. Of course, this makes perfect sense in all cases. I don't think it's as much about the fact that they're teenagers, as it is about the self-centredness that comes with trying to find oneself. A necessary evil.